What is more important to you: an affordable web-hosting service provider that keeps evolving to prove itself or an established service that may have stopped growing? If you are interested in the quality of these hosting services more than the name, then Web Hosting Hub may just fit the bill. They have been around since 2010 and have gradually made a name for themselves with the kind of hosting plans and services they offer. The good part about emerging hosting service players like Web Hosting Hub is that they constantly thrive for more, and hence, go out of their way to prove their worth. You are bound to get great customer service from them. However, before you develop an overall opinion about this hosting company, let’s check out their various features, plans, and pricing. We shall also list their pros and cons so that you can make an informed decision about your next website or blog hosting. Before you avail services from any hosting provider, it always helps to know where they’re coming from. This US-based hosting company started in 2010 in Virginia Beach, VA. They eventually expanded to add another data centre location in Los Angeles, CA. Since the start, their aim has always been to offer easy-to-setup and affordable hosting plans, along with appropriate web design services. They have been known to offer quality customer service and support, and a true testament to this fact is the A+ rating received from the Better Business Bureau (BBB). The fact that a number of small businesses are now banking on the Web Hosting Hub to satisfy their hosting needs proves that this company is rapidly emerging as one of the most reliable service providers for small companies (and individuals as well). The company has also won several hosting awards from different web hosting review sites in such a short span of time. The 90-day money back guarantee that Web Hosting Hub offers is a great way to tell how confident they are in their services. However, let’s take a detailed look at the features that make it a reliable, secure, and affordable hosting provider. The first thing anyone looks out for in a hosting provider is the server uptime. After all, minimal downtime is important for websites to avoid any negative impact on site visitors or the business. We tried one of their basic hosting plans for a blog and the average uptime percentage for initial 75 days was around 99.2%. If you do a bit of research online, you will learn that the average uptime quoted by reviewers is about 99.8% who have used these hosting services for more than a year. It’s ok for a relatively new web hosting company, and with experience, the uptime percentage will only get better. Any new webmaster will be extremely satisfied with his site staying online for more than 99.5% of the time. 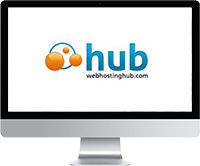 The best part is that Web Hosting Hub is known for its lightning fast customer service. The company also enables zero-downtime transfers of your website, leading to a smooth transition from any other hosting provider to their servers. You can select one of the two data centres located on the east coast and west coast of the U.S., opting for the one that is closer to you for faster load speeds. They are running high-performance, DELL servers with 24 Intel Cores, 24GB memory, and RAID 10 storage, along with BPG route optimiser and 20 gigabits of bandwidth. Web Hosting Hub makes use of Mozy cloud backup service for Windows and Mac users. You can also use it to take continuous data backups, manually or by scheduling updates. For additional security, this provider offers w/suPHP, an advanced site security measure while SSL certificates are provided for one of their hosting plans (Dynamo). It ensures that you get secure access to POP3/IMAP email along with reliable SPAM protection. You can even sign up for McAfee email protection services. They can officially claim that the ‘customer comes first’ because of the terrific customer support. Once you make the payment for any of their hosting plans, you receive the confirmation email with details about the activation and login credentials. One of the Web Hosting Hub representatives gives you a call and gives you suggestions to get the most out of your hosting account. Such a personal approach on signing up is rarely provided by any other hosting company. Apart from excellent sales support services, you can contact the technical support team for any issues related to your hosting account or site performance. Customer support is available 24 hours a day, 7 days a week. You can call them on their telephone number 1-877-595-4482, or opt for a live chat. The customer support team responds quickly and remains in touch with you until your issue is completely resolved. Even if you aren’t good with technical stuff, the support team is well trained and extremely knowledgeable, and will help you out of any difficult situations. Their official site offers access to their extensive support documentation (Help Centre, Learning Corner, Community Q&A) through their ‘Support & Community’ section. It provides the industry standard cPanel, which is already known to many webmasters and is extremely easy to use. It offers a getting-started video as well as Wiki instructions for beginners. So, even newbies can quickly get started and get to work with this control panel with ease. Their packages come with Linux hosting and integration with Softaculous. This provides you access to 1-click installs for over 310 free web applications. Thus, your different requirements for a blog, e-commerce platform, or forum can be fulfilled easily. You get several free tools like WordPress, Joomla, Drupal, and PrestaShop. CPanel makes it easy to manage all your email accounts from a single place. You can easily create new email addresses, as well as set-up email forwarding and filtering. It assists you with free backups, and helps you manage files and sub-domains, and analyse site statistics easily. In a nutshell, the cPanel offered by Web Hosting Hub has everything you could need to manage your website hosting. This is a starter plan, ideal for absolute newbie webmasters who need hosting for simple websites or blogs. It is available at a cheap price of $1.95 per month (for the first 3 months). If you are a small business, this affordable plan would suit you best at $6.99 per month. If you own a website with significantly high traffic, then this is the plan to go for. It would cost you about $10.99 per month. These three plans all come with free email address, free website builder, WordPress installation, a shopping cart, a free domain name and free transfer for three websites. One of the key benefits of this hosting service is the extremely affordable prices for all three of their plans. It is heartening to see a web hosting service offer a ‘full’ money back guarantee, and that too for a longs period of almost 90 days. Thus, you can purchase a hosting plan of your choice without any risk. You get free consultation for the design of your business websites with every plan, and can use Web Hosting Hub’s custom design services and get attractive discounts, if you are opting for the Nitro or Dynamo plans. The company can easily boast about their excellent customer services. The icing on the cake is the special call that you get once you purchase a hosting plan from them. You get thorough guidance over the phone to help you setup your hosting account in the best possible manner. Their two data centres are powered by green, sustainable energy with a goal to minimise carbon emissions. If you care for the environment, then they should get your vote. For all the three hosting plans, you need to pay an additional $1 to use the automatic account backup feature. The most basic ‘Spark’ plan offered by Web Hosting Hub entitles you to host only two websites or blogs. This number needs to be increased. This provider does not offer VPS or dedicated server hosting at all. So, if that’s what you want, look elsewhere. Web Hosting Hub can satisfy basic shared hosting needs for most blogs, websites, small business sites, discussion forums or eCommerce portals. It can save you a significant amount of money and comes with great customer support. With the option of 90-day full money back guarantee, this hosting provider is definitely worth a try! So what hosting provider are you using right now? What are the primary issues you’re facing with their service? Let us know in the comments below, and thanks for asking! How does Web Hosting Hub Rank? WHAT WEB HOSTS DO YOU RECOMMEND? Why not give Web Hosting Hub a go? !